Man, Hasbro and their black repaints, amirite? Ready at any time, Tony Stark's latest invention is mentally controlled, liquid-metal armor! This armor, cleverly named the "Black and Gold Armor," debuted as part of the "Marvel NOW!" initiative, making this Iron Man a contemporary of Captain America, Hawkeye, Cyclops, Thor and Vision. Tony wore this suit after expelling all the Extremis tech from his body, but before going to space. He carried the suit around in the form of loose goo in a briefcase. Considering the average size of a briefcase (outside dimensions of 25" x 18" x 4" and a wall thickness of ¼", for a carrying capacity of approximately 7 gallons) and the surface area of a man Tony's size (6'1" and 225 pounds [per Marvel's official site] = 2.26 m²), most of the armor would end up being less than ½" thick. Does it still weigh 200 pounds? In the comics, the Black and Gold Armor was pretty much just the movie armor in new colors (because, like we said before, how else was Greg Land supposed to trace it?) - if you look at the actual designs (for instance, on one of the variant covers of Iron Man #1), it was originally meant to be a bit more distinctive than that. But, no matter what it was meant to be, that's not what it was. Land drew the movie costume, so Hasbro just repainted their Iron Man Mark IV figure and called it a day. For the most part, it works decently, but he's short a few dots - like the "Heroic Age" armor, this suit is covered in repulsor ports. There should be two smaller ones at the corners of his chestplate, and on the outside of his hips. 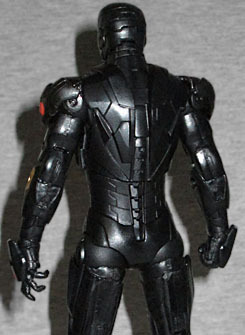 The back of the figure is almost solid black, which seems like lazy corner-cutting, but it's not - if you look at turnarounds of the design, it really is colorless back there. Okay, there should be two more repulsors on the back of the shoulders, but that's minor. The figure has balljointed ankles, double-hinged knees, swivel thighs, swivel/hinge hips, balljointed torso, swivel/hinge wrists, double-hinged elbows, swivel biceps, swivel/hinge shoulders, hinged neck and balljointed head. The shoulder pads are hinged as well, so he can raise his arms. The flaps on the backs of his hands aren't mobile, so don't expect a palms-out blasting pose. Also, the left ankle on mine is very loose and wobbly, but hopefully that isn't something you'll have to worry about. The hands do pull out pretty easily, though - that's a holdover from the Iron Man 2 line, where this mold first appeared. However, Marvel NOW! Iron Man doesn't have any accessories - not even the alternate hands from before. But that's because he comes with a Build-A-Figure piece! The BAF for Avengers 2 Series 2 is the Hulkbuster, and Iron Man comes with the right leg. It's huge and heavy - it weighs more than the actual figure does! 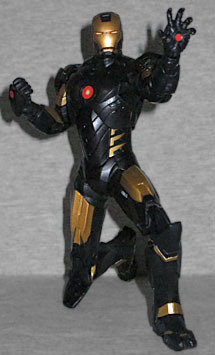 Amazingly enough, this is not the only black Iron Man repaint in Series 2. It's like a theme! Using an existing movie sculpt for this comicbook figure worked out really well, and this suit will look great alongside all the others.